Is Evgeny Kuznetsov’s game winner the greatest goal in Capitals’ history? Evgeny Kuznetsov's series-clinching goal to eliminate the Pittsburgh Penguins ranks among the greatest goals in Capitals franchise history. But is it No. 1? WASHINGTON — There is no denying that Evgeny Kuznetsov’s series-clinching overtime winner Monday in Pittsburgh ranks among the greatest playoff goals in Washington Capitals history. 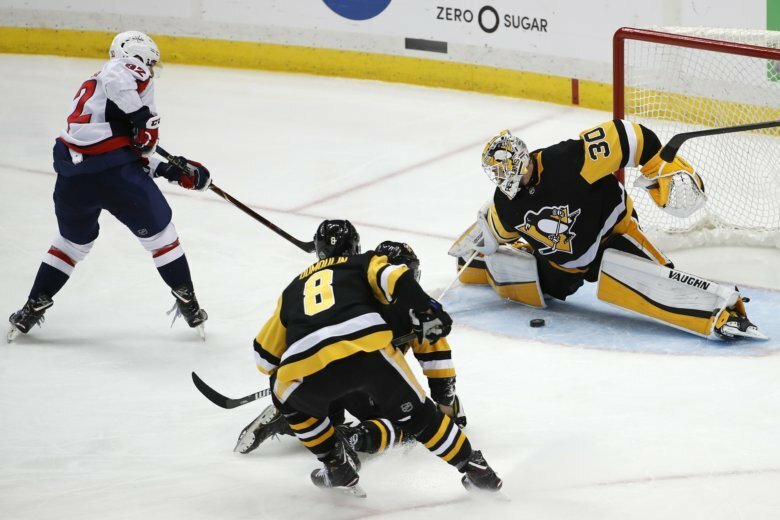 The goal not only secured the Capitals’ first berth in the Eastern Conference Final since 1998, but it also ended years of playoff disappointment against the rival Pittsburgh Penguins. But does the Kuznetsov goal rank No. 1 all-time in franchise history? Based on an informal poll I conducted on Twitter, opinions vary. One thing we can all agree on, though: Debating where game-winning goals rank sure beats ranking Game 7 defeats. I’ve included my list below. Excerpts from the book 100 Things Capitals Fans Should Know & Do Before They Die were used in the descriptions. By the late 1980s, the Capitals had emerged as one of the NHL’s best teams in the regular season, but playoff success still eluded them. In 1985, the Capitals blew a 2-0 series lead in the best-of-five Patrick Division Semifinals against the New York Islanders. Two years later, the NHL expanded the first round to a best-of-seven, but the Capitals blew a 3-1 series lead to the Islanders. The Capitals 1987 season ended with a quadruple overtime loss at home in Game 7, a game that is simply known as the Easter Epic. With a reputation as postseason underachievers starting to surround his team, Poile acquired proven playoff performer Dale Hunter in a trade with the Quebec Nordiques in June 1987. The following spring, Hunter proved his worth in a first-round series against the rival Philadelphia Flyers. After falling behind the Flyers 3-games-to-1 to start the series, the Capitals rallied to once again force a decisive seventh game on home ice. Philadelphia would jump out to a 3-0 lead in Game 7, but the Capitals came back, with Hunter scoring the eventual game-winning goal to secure a 5-4 win in overtime. The win came nearly a year to the day after dropping the Easter Epic. “We showed that we’re not chokers,” Hunter told reporter Jeff Rimer on the Home Team Sports broadcast that night. Decades later, former Capitals forward Kelly Miller still appreciates what the win meant for the organization at the time. “Overcoming [a deficit] and having to battle through, I think, was more than satisfying, especially against a team like Philadelphia which was a huge rival,” Miller said in 2017. It took 10 trips to the Stanley Cup Playoffs in the Alex Ovechkin era, but the Capitals have finally returned to the Eastern Conference Final thanks to Evgeny Kuznetsov’s OT winner in Game 6 against Pittsburgh. It’s the biggest goal in the Ovechkin era and therefore it’s likely the most memorable goal for a large portion of the team’s younger fan base. The fact that the goal came after years of second-round heartbreak and that it came against the rival Penguins only adds to the significance. “I mean, it just feels unbelievable,” Kuznetsov said soon after netting the biggest goal of his career. “When you get first round, then you get second round, it’s pretty emotional. It wasn’t aesthetically pleasing, but for a franchise that waited 24 years to play for the Stanley Cup, style points didn’t matter. So, when Joe Juneau finished off a goalmouth scramble by jamming a rebound past Buffalo’s Dominik Hasek in Game 6 of the 1998 Eastern Conference Final, the celebration was on. Juneau’s overtime winner, six minutes 24 seconds into the extra session, sealed a 3-2 victory and secured the Capitals’ first conference title. Just over six minutes into OT, Sabres defenseman Darryl Shannon turned the puck over to Juneau at the Buffalo blueline. Juneau then fed linemate Brian Bellows as he was entering the zone with speed. “I remember getting the puck and just driving wide,” Bellows said in explaining his strategy to beat Hasek. “My thinking is, I’m basically going to try to get a couple of guys into the net. I knew I wasn’t going to score. So, the thought becomes, ‘Just take it to the net.’ You’re hoping to cause a commotion or some chaos and maybe the puck will just be laying there. And that’s what happened. Bellows did in fact drive to the net and had three chances to beat Hasek from in-close. Hasek stopped them all, but along the way he fell to the ground, sprawled out trying to retrieve the loose puck. With the puck just out of Hasek’s reach, Juneau was able to bang in the winning goal. Some will argue that Juneau’s goal that sent the Capitals to the Stanley Cup Final in 1998 should be ahead of both the Hunter and Kuznetsov tallies because it was deeper in the playoffs. Again, it’s a fun debate. I have both the Hunter and Kuznetsov goals ahead of the Juneau goal because Hunter’s and Kuznetsov’s were years in the making for the core of both teams. They each represent significant benchmarks for teams that struggled to hit them. Kuznetsov’s goal, a case can be made, was a decade in the making. Ten postseason trips in the Alex Ovechkin era and finally a breakthrough. The 1998 Capitals, meanwhile, as great an accomplishment as it was for them to reach the Stanley Cup Final, the team was very much a one-hit wonder. They missed the postseason a year earlier in 1997 and they went on to miss the playoffs again in 1999. The goal wasn’t years in the making (unless you consider the franchise’s entire 24-year existence leading to that moment), and there wasn’t any momentum built from the goal. The Capitals were swept in the Stanley Cup Final and didn’t win another playoff series for 11 years.